'World of Dance' Duels competitors BDash and Konkrete. Photo by Justin Lubin/NBC. After much anticipation, The Duels of World of Dance have finally commenced. The highest scoring acts from the Qualifiers had a chance to choose who they want to dance against. While two acts would enter the stage, only one would survive and secure their spot in The Cut round while getting one step closer to a win. ‘World of Dance’ Duels competitors Karen y Ricardo. Photo by Trae Patton/NBC. The Duels started off with a bang as Karen y Ricardo faced off with Luka and Jenalyn to see who would move on to The Cut. Karen y Ricardo delivered a salsa routine that was fire from the start. They brought even more flare to their partnering style by adding even more amazing footwork and partnering stunts that raised the bar even higher than they had before. This spicy performance was enough to bring the judges out of their seats as Karen y Ricardo received rave feedback for such a great routine. There was no holding back for Luka and Jenalyn as they faced such a dynamic couple, and they brought in some great elements to their routine that would top their performance from the Qualifiers with a twist to their cabaret ballroom style. With Jenalyn in straight jacket, their partnering reached a whole new level of difficulty, and it was the perfect touch to a well thought-out concept. Luka and Jenalyn added even more daring partnering stunts that they had not before to take their routine a step further, which did not go unnoticed by the judges. Although both couples put up an amazing fight with their routines, Karen y Ricardo made a lasting mark in this round after scoring a 98.3 and will be moving on to The Cut. ‘World of Dance’ Duels competitors Expressenz. Photo by Justin Lubin/NBC. Next to go head-to-head on the World of Dance stage were The Untouchables versus Expressenz. Although these groups brought completely different styles to the table, they both had an energy and drive to them that could not be denied. The Untouchables hit the stage first, bringing a performance that was different than what was expected of them. Equipped with a warrior-themed routine, The Untouchables delivered a performance that still had their Latin flair that was seen in the Qualifiers but took a risk by mixing in contemporary to their routine as well. They were polished throughout each movement and transition, leaving a memorable routine on the stage. Expressenz focused on their storyline as well, making the topic of suicide the center of their routine. Their performance was a mixture of great lines and grace matched with equally moving emotion and amazing control. It was contemporary at its finest, and Expressenz made a lasting impression with this particular performance as they moved the judges to tears and received a standing ovation from them as well. With a score of 94, Expressenz will get to continue to make strides with their amazing technique and performance quality in The Cut round. Krumping versus ballroom dance was the next match-up as The Duel round continued to heat up. B Dash and Konkrete paired up against Pasha and Daniella, contrasting their very different styles and leaving it all on the dance floor in hopes of moving forward in the competition. 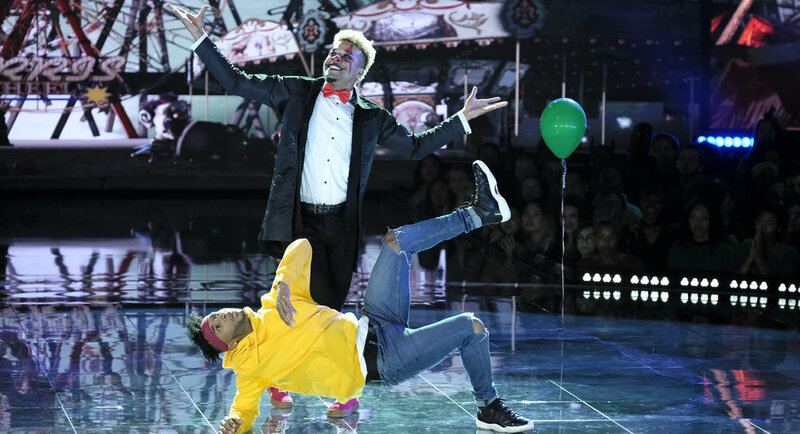 B Dash and Konkrete delivered a twist to krumping with a circus-themed performance. Although it is not normal for krumping, they took a risk and added a narrative to their routine, which was translated exceptionally well from beginning to end. Along with an infectious beat complemented with popping and locking that was on a completely different level, B Dash and Konkrete left a lasting impression on the judges and audience alike. Pasha and Daniella also took a risk of their own with the ballroom genre by incorporating more lifts and elements that would not normally be seen. Their transitions were fluid as they mixed elegant and hard-hitting movements to capture the essence of their music choice. Pasha and Daniella were electric in their energy, and it flowed through each element of their performance. Even though both duos took a risk, only one could make it through to the next round. With a score of 94.3, B Dash and Konkrete’s risk-taking proved them worthy to move on to The Cut and even closer to the $1 million prize. ‘World of Dance’ Duels competitors The Fabulous Sisters. Photo by Justin Lubin/NBC. The Fabulous Sisters and Rascals were next to face one another in The Duels round, and both groups came out swinging as the competition escalated. 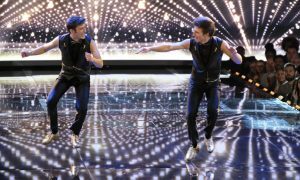 The Rascals stormed the World of Dance stage first with energy that was out of this world. They were serving sickening grooves from the very beginning of their routine and slowly built up to the hype energy that the judges loved in the Qualifiers round. The Rascals were gritty yet subtle not only in their movement but also in their facial expressions, which tied their routine together perfectly. Not only did they have swag throughout their performance, but they kept their movements and tricks in sync, which added great dynamic to the group as a whole. Known for their unbelievable synchronicity, The Fabulous Sisters began their routine with visuals that were picturesque as they slowly moved to create another picture. The isolation in the very beginning movements were enough to give J-Lo the chills, and The Fabulous Sister’s performance continued to build as the music built. There was intense emotion in the dancers’ faces, which added to the excitement of the music, and the power in each movement was crystal clean throughout the performance. According to Ne-Yo, the performance was art in motion. This was the finishing touch that The Fabulous Sisters needed, and with a score of 95.7, they knocked the Rascals out of the competition. ‘World of Dance’ Duels competitor Michael Dameski. Photo by Justin Lubin/NBC. Next to go head-to-head with each other was Michael Dameski and Angyil. Michael Dameski was first to hit the stage with a contemporary routine that had him venturing out of his comfort zone. Equipped with the same athleticism, he took things a step further using counter rhythms and filling up every bit of his music. Michael’s control, matched with his technique, was prevalent throughout his performance with 10 times more passion added in to make pure artistic beauty. His performance was an emotional rollercoaster that he brought the judges along for, and it proved to make a great mark on the World of Dance stage. Angyil brought her signature freestyling to the battle against Michael, and she started out with great energy through each movement she made. With each beat or nuance in the music, Angyil matched it with crazy isolations and transitions to parallel the music. Although they both gave great performances that highlighted each one of their strengths, Michael Dameski came out on top, receiving a score of 94.7. ‘World of Dance’ Duels competitors Bradas. Photo by Justin Lubin/NBC. It was hip hop versus tap as the next two groups took the stage in hopes of making it to the next level of the competition. The Bradas hit the stage first with a suave hip hop routine chalked full of great tricks and grooves for everyone to enjoy. They stepped up their games from the last performance by adding more dance into their routine to bring the most entertainment possible. The Bradas even added tap element into their performance as a response to their competitor; The Jam Project. Following the Bradas, The Jam Project brought their energy to a new level with a fun-filled tap number. Their feet were like fire on the stage as they powered each step along with counter-rhythms. The Jam Project’s sounds were crisp and clean, and they offered great dynamics through each transition in their routine along with performance quality that was through the roof. Both groups made scoring hard for the judges, however the Bradas came through with a win after scoring an 89.7. ‘World of Dance’ Duels competitors Avery and Marcus. Photo by Justin Lubin/NBC. Closing the first round of The Duels was Eva Igo vs. Avery and Marcus. Pressure was already high as the duo would be competing head-to-head with the first runner-up from last season. Eva Igo was first to leave a lasting impression on the judges with her solo. She delivered a heartfelt contemporary solo and also brought the fire that the judges loved so much last season. Eva showed a great connection with the audience and judges with her signature technique and unbelievable control throughout her routine. This powerhouse of a dancer wowed the judges from one transition to the next and left a lasting imprint on the World of Dance stage with her finishing element of her solo. With the pressure running high, Avery and Marcus pulled out all the stops to bring something new and eliminate the nerves from the last round. Their fusion of ballet and contemporary was strong as they hit each movement with flawless technique along with amazing execution. Avery and Marcus did a great job of highlighting each other’s strengths and then shining together. Scoring these two talented performances was by far the hardest for the judges, but in the spirit of seeing something new on the World of Dance stage, Avery and Marcus will move on to The Cut. Tune in as The Duels continue and dancers get closer to winning the $1 million prize and the title of “World’s Best Dancer”. You won’t want to miss it!